When I arrived at Baked and Wired, after a bus and a schlep down 30th street, I was extremely unenthused to find a line out the door. What I did not know was that Baked and Wired is one of “those places” where people queue outside in 85 degree heat to buy expensive and trendy pastries. There is nothing wrong with that, but typically this is not my scene. I typically prefer a spot where I can grab a quick cup of coffee and a seat and spend a few hours lost in a book, writing emails, or pretending to be productive in some other way. Once I was inside, I realized that it is actually that kind of place, or rather half the store is that kind of place. There are actually two totally separate counters inside, one for coffee and one for baked goods, which form a delicious symbiosis. From the bakery, I purchased a pistacio cupcake. From the coffee bar, I bought a cup of coffee. The coffee was acidic and a little fruity- a nice sharp note compared to the creamy sweetness of the cupcake. And unlike most cupcakes, this one had little nut-nuggets in it to add a nice texture. Together, the two of them made a lovely afternoon snack. Alone, I think the coffee would have still been drinkable, but the cupcake certainly enhanced the experience. The decor could best be described as mixed. The coffee bar area has no seating. The bakery is standard contemporary-cute and displays cupcakes under glass beakers. Down a few steps from the bakery, there is a massive shell-shaped couch that faces an american flag. In the back, things get real weird. Napinks are attached to napkins with baked and wired stickers in what must be a fire marshalls nightmare. Somewhere under all the napkins, I am sure there is a wall with more napkins attached to it via stickers. Each leaflet in the strata is marked with a thoughtful doodle or a few words. La Colombe was (and is) my ultimate stop for coffee in D.C. Ultimate in both senses of the word- final, as well as the best. If you want to have the best coffee that I found in D.C., this is absolutely the place to go. Sadly, I did a terrible job of getting photos of it, so you will have to bear with a mostly-words description. La Colombe is decorated with sedate walnut stained wood, warm brick, and cool steel. Everything else is black. The lights are a slightly warm white, and are augmented (and overpowered) by a large skylight and by the windows. The indirect light from is very warm since it is reflected off the reddish brick and wood surfaces. The chairs and furniture appear to be site-specific and have matching stain and hardware across the store. One notable feature is the black and brass features on the furniture- something I have not seen elsewhere. The coffee was amazing. I had something fruity from their workshop selection, and it was easily the best coffee I have had in at least a year- maybe more. I described it in my notebook as “it smells and tastes of cherries. It is acidic, fruity and clean”. The coffee was served in a highly decorated mug, with blue and red floral and bird patterns. The saucer had a matching bird and floral pattern. Easily the coolest mug to date, aside from the old monkey-on-a-rocket-ship mugs from Diesel. That is high praise coming from me! The Best Coffee In Washington, D.C. I visited D.C. over the weekend of the 9th to see an exhibit by one of my favorite artists- Robert Irwin. After that I had a couple days to kill and I decided I would go on a coffee tour of the Capitol. Based on recommendations from friends and cafes that I stumbled upon, I managed to visit 9 cafes in the D.C. area. Below are my comments on each one. Check out the map above for information on location and my recommendation. Green Star = Best coffee in the area! My strategy was to hit all the outliers that had late closing times on my first “day” from about 3-8, and then sweep the Green/Orange line stops on my way to Union Station on day 2. I decided to add peregrine to the list of day 1 locations so that I would have about 4 cafes on day one and 4 on day two- to even out the coffee intake. The day one list was peregrine, filter (since foggy bottom was closed on the weekends, I ended up going to Dupont circle), Baked and Wired, and finally Northside Social, which was far away but had late hours. Day two began, surprisingly, with Slipstream and Dolecezza, which I happened to run into on the way to Compass Coffee. After Compass I hopped a bus down to Chinatown Coffee Co and finally La Colombe. 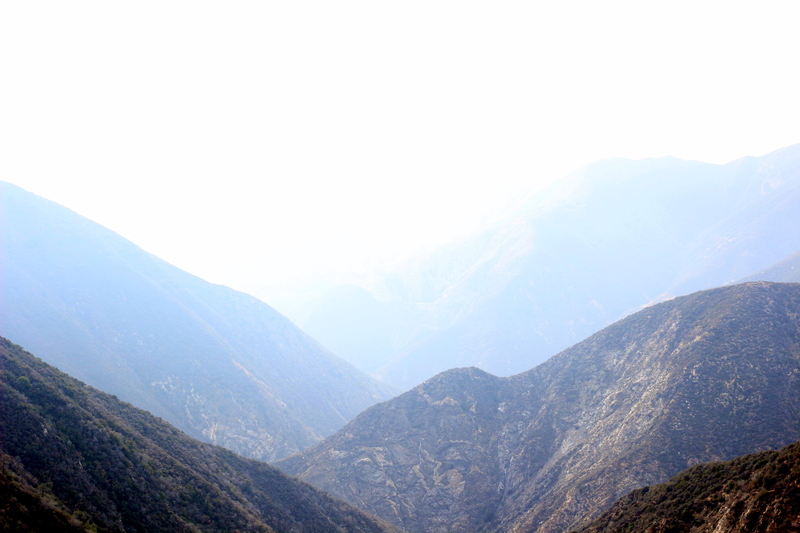 This hike is not for people who are claustrophobic, acrophobic, or who are not in tip-top shape, but I went anyways. That being said, it is a long, hazardous and very rewarding adventure. After being thwarted by Stanley Miller on two separate occasions (for various reasons), my brother and I decided to test our luck on the closer and seemingly easier to reach the 100 year old site (just last year year!) of the Allison mine. This mine made the late Hugh Blanchards list of “Local Gold Mines We Will Never See!”, which only made it more appealing. Hugh Blanchard lists it as a 14 mile hike with 3000 ft of elevation gain, but we clocked in at 10 miles with ~2400 ft of elevation gain. The most direct route starts at the Henniger flats parking lot. After departing from the trailhead, you head upstream making a few river crossings, which should all be pretty easy. 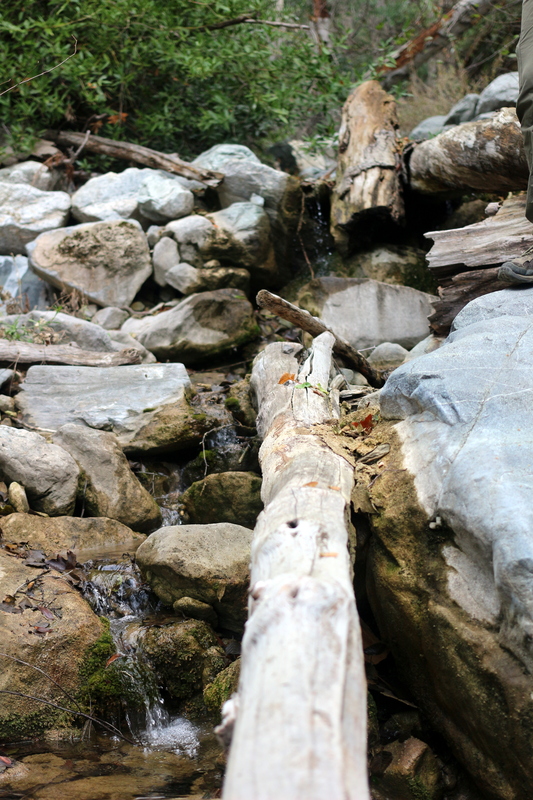 All the crossings have some kind of feature (log, rocks) to assist in crossing. At no point should you have to step in the water! The same goes if you are heading to the bridge to nowhere. At some point, you should see swan rock (pictured above) as the river makes a left turn (relative to heading upriver, a right turn if you are headed down). It is my belief that the part that looks like a “swan” is that white part in the middle of the rock. It is also important to mention the scale and location- it is a massive, nearly vertical cliff face, not a huge boulder. A fraction of a mile upriver is the entrance to Allison Gulch, and where you start to take the trail off the (literally) beaten path of the east fork. Its most defining feature is that there is some kind of concrete drainage ditch there. The gulch itself is actually quite pleasant during the day. The white rocks are set off by deep piles of red leaves and the steep sides and foliage provide good sun protection. We brought a water filter with us so that we could stock up on water when it was available. This was a good idea, because we didn’t have to carry all our water with us all the time. 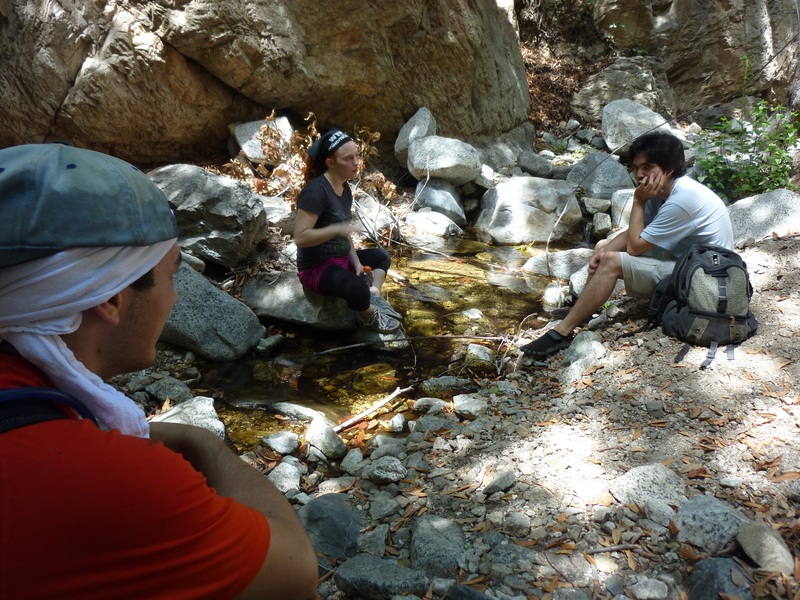 Fortunately for us, we found plenty of water in the gulch- at the bottom, at the point where we ascended, and finally at the mine, so we never had to worry about running out of water, although we were conservative on the way up. A mile or so upstream of the entrance to the gulch there are conspicuous markers that lead to the trailhead, which include but are not limited to a pair of boots on some small trees, a rusting shovelhead, and a jacket that is stiff from exposure. This marks the beginning of about 2000′ of elevation gain over about .4 miles (walked distance), on a sun-drenched and steep trail, mostly made of dirt but including occasional piles of scree. If it had been hot, I think we would have turned back! As it was, we took frequent breaks and ate lots of snacks. At the apex of our ascent, the path took a sharp turn to the right and followed a contour line back towards the gulch. The reason the path was created becomes apparent when you realize that the canyon, for all intents and purposes, ends in a sheer drop not far from the mine, making it impossible (or at least, improbable) to navigate to the mine via the floor of the gulch. 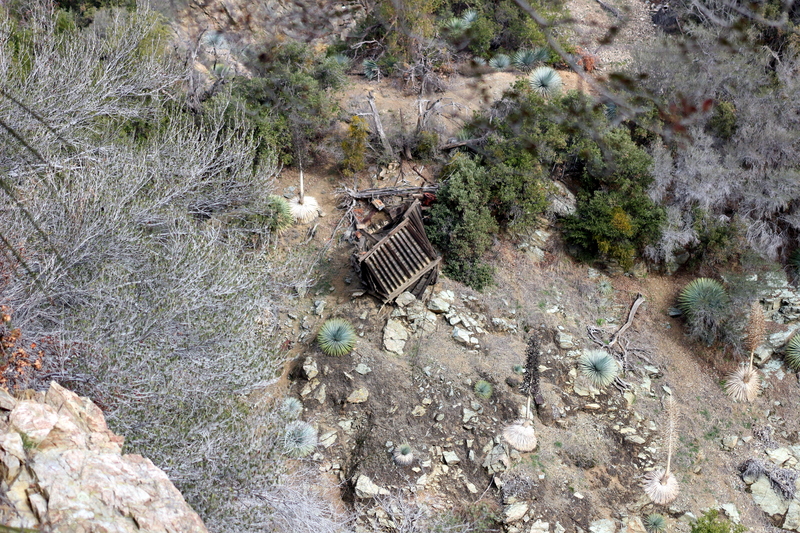 As we got closer to the mine, we saw one of the few structures left standing- an ore hopper. 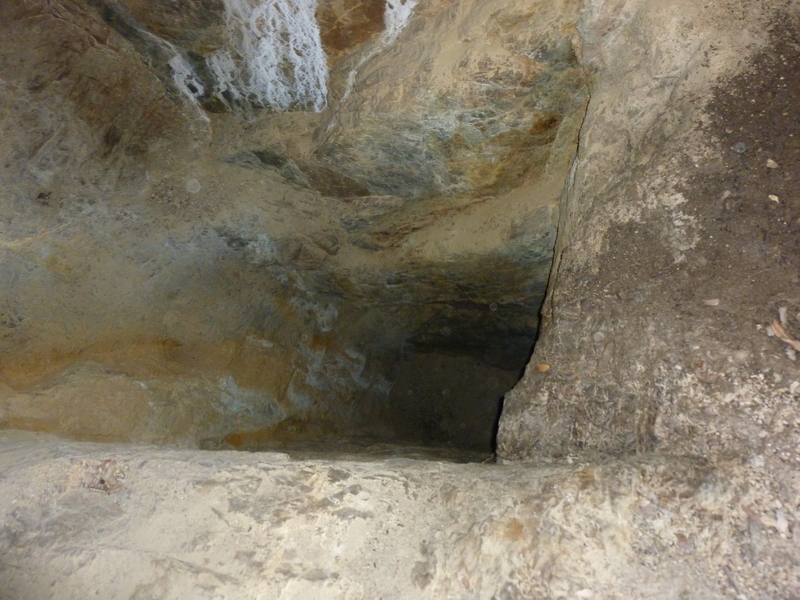 At the site of the mine we discovered three entrances which we explored (two of which connected). One was practically paved with cans at the entrance, and featured many branches, one of which ended in a cave in. 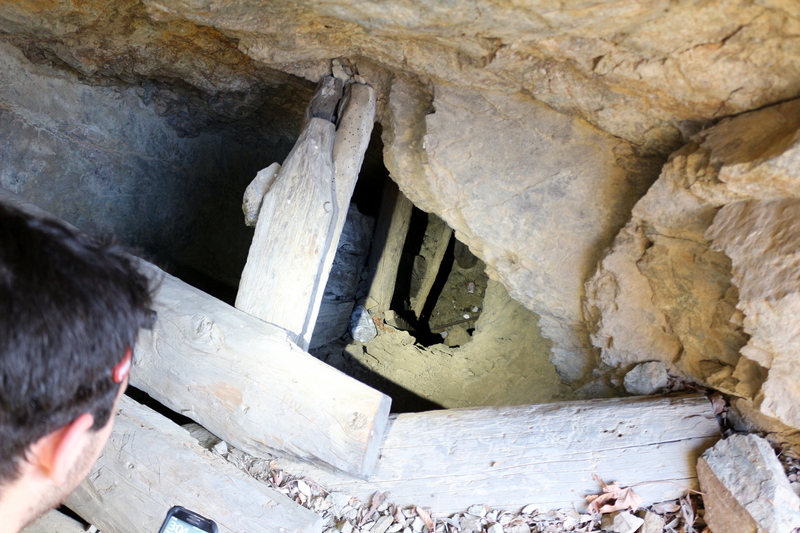 The other digging featured two entrances and many vertical shafts which we did not have the time, people, or equipment to explore, although we did photograph them. At the upper entrance to this digging we found what appear to be even more tunnels, although we were running out of time to explore them. We also noticed the remains of a camp site up around the mine. The equiptment looked disturbingly modern, but it had clearly been there for some time as the tent had been blown around and the sleeping bags had been sun-bleached- we wondered where the people were, and we hoped the answer was not that they were in the collapsed section of tunnel. In another part of the enormous mine site, we found a cache of what appears to be a sleeping bag or pad and a tarp, as well as some 5 gallon buckets. These were in a well-protected area, so they may be the same vintage as the tent, but it is hard to tell because they are not weathered. By the time we had filtered more water and made our departure from the mine site, we knew we wouldn’t make it back without some night hiking. 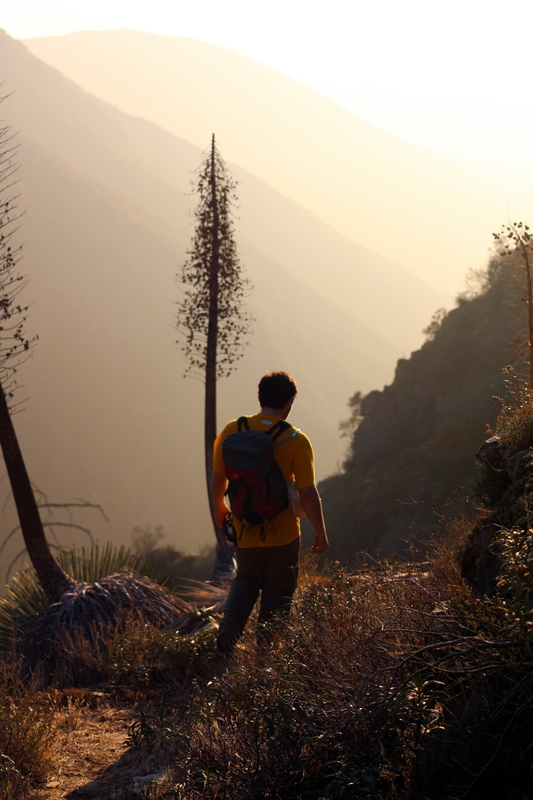 As the last rays of the sun diffused through the hazy canyon, coating everything in a golden glow, we were working as fast as possible to get off the mountain. At one point, we got off the trail, which was a costly mistake- it is considerably more difficult to get down in one piece where there is not a trail, and there are many small paths that look like trails. This is basically the last we saw of the sun. While it was an amazing view, it meant that by the time we hit the floor of the narrow and overgrown gulch, it was very dark. Our headlamps came out again and we made our way down the gulch, this time picking up on an actual trail and saving lots of time. By the time we made it back to the trail we were sweaty and sore from pounding our joints on the steep decent. By the light of our headlamps, we started our hasty retreat to the parking lot. But the adventure was not over yet! On our way back we found a couple of people and a couple of dogs (two of each! a couple of couples) trying to navigate their way back to the parking lot without any kind of light (save the moon, which was about 3/4 full). 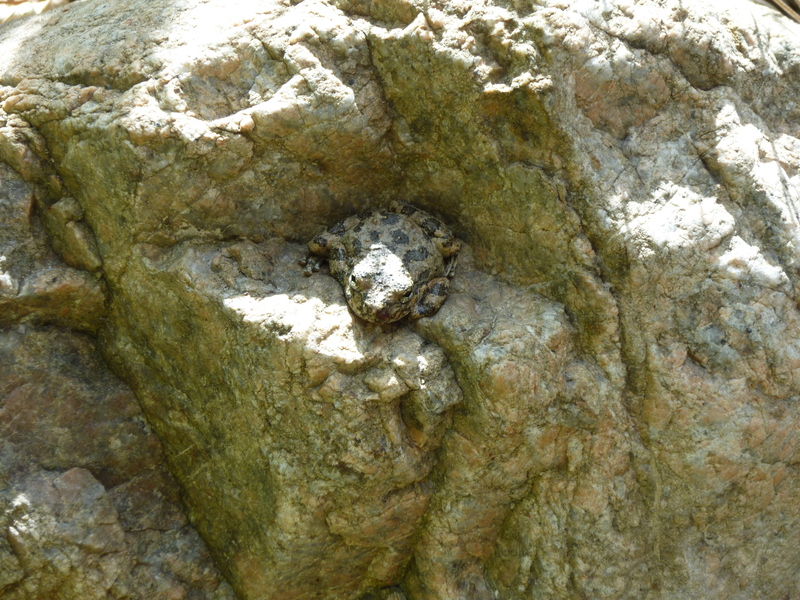 We shared our light and escorted them back to the parking lot, over quite a few steep rock steps and river crossings. 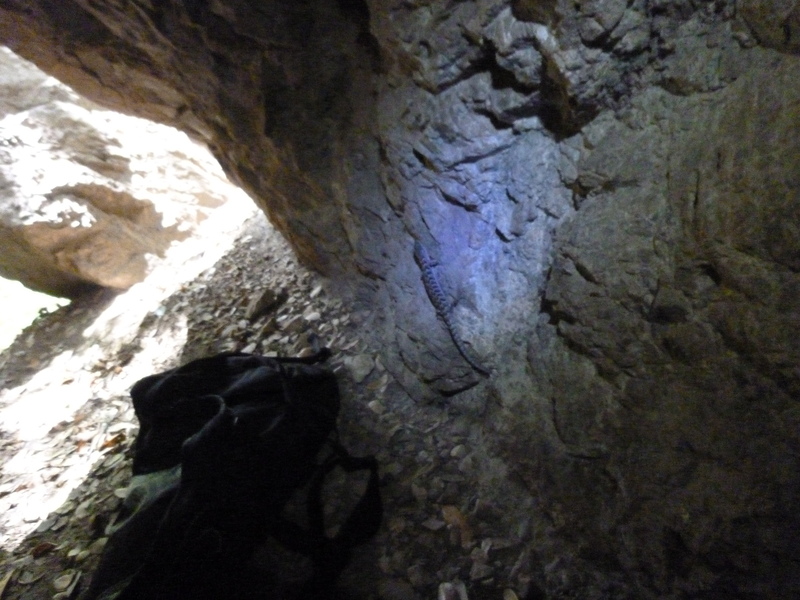 Today I went back to Dawn mine with some of my friends, with the intention of looking for the upper mine entrance, which we skipped last time because it was so dark when we arrived. 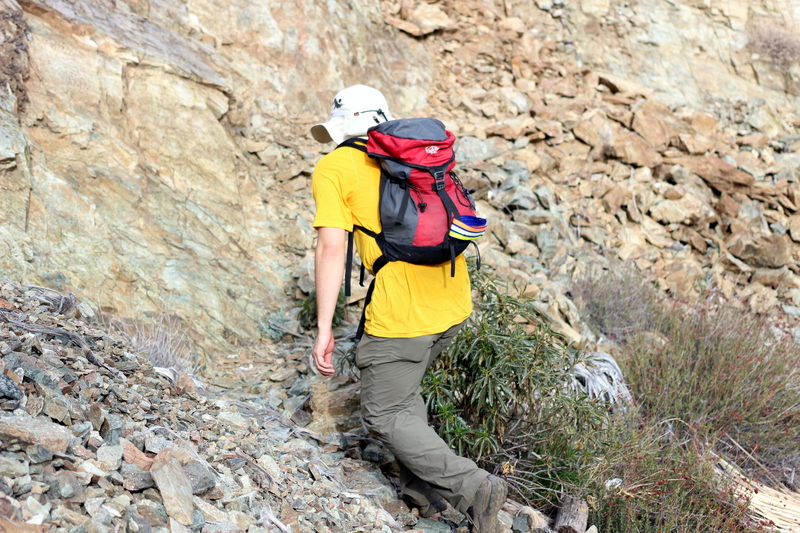 It was the same rocky hike up and over and around boulders up Millard canyon to the mine. Unfortunately by the time we picked up the adventure parking pass from REI (which opened at 10) and drove to the trailhead, the temperature was already starting to reach its peak. 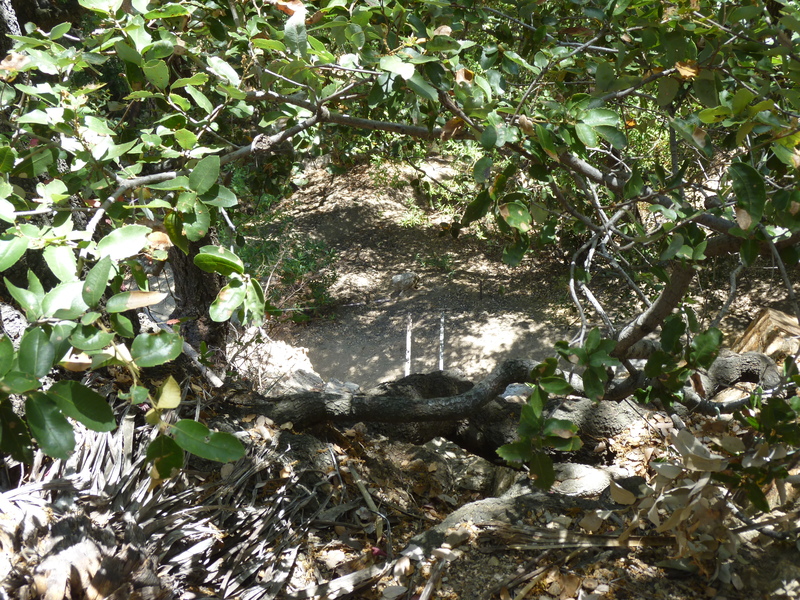 This was unpleasant on the high, exposed trail to the ranger station where the trail drops into the riverbed, but once we reached the canyon floor it was actually pleasant in the lush, overgrown and therefore shady areas. 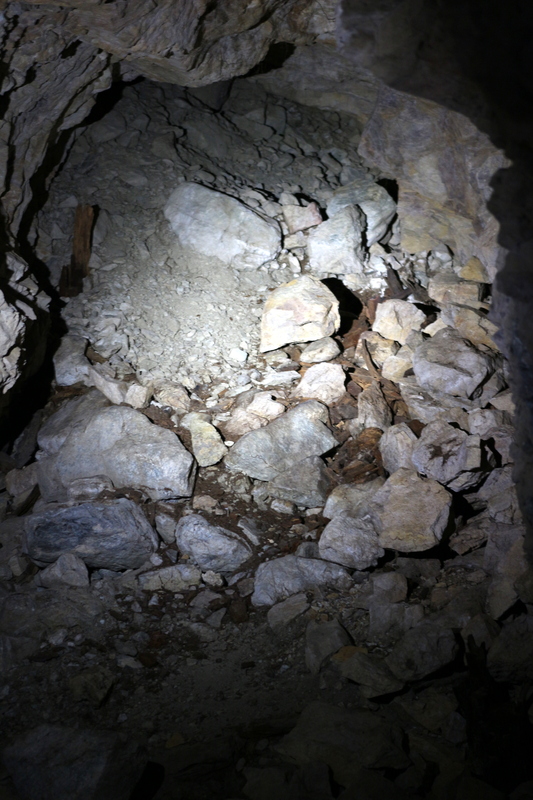 After a quick stint in the lower mine, we decided to search for the upper entrance. I noticed a climbable ledge to the left of the entrance. This path seemed to match up with the path to the upper mine entrance mentioned on LA goldmines, so we decided to proceed up the steep cliff above the mine entrance. 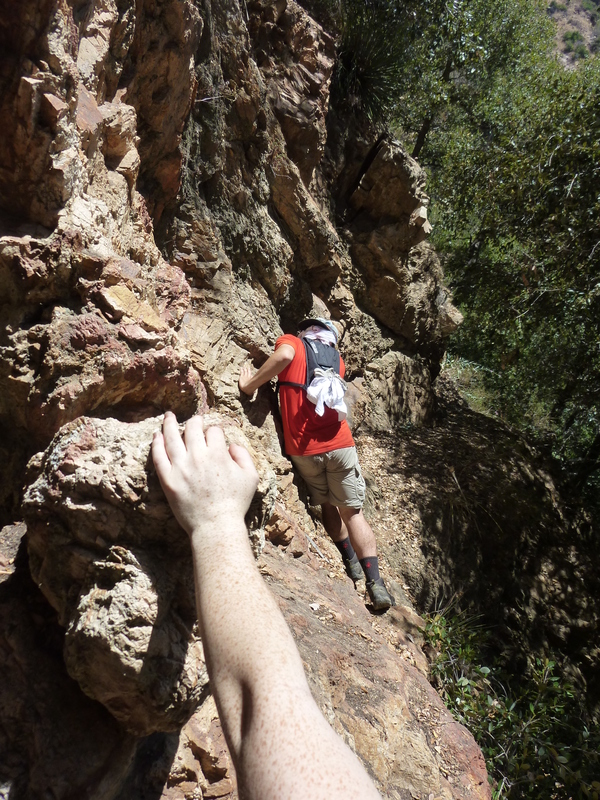 It was a not a particularly tough climb, but it was amazing how rapidly the ground seemed recede as we climbed; I would estimate that the upper mine entrance was about 80 feet or so above the original entrance. 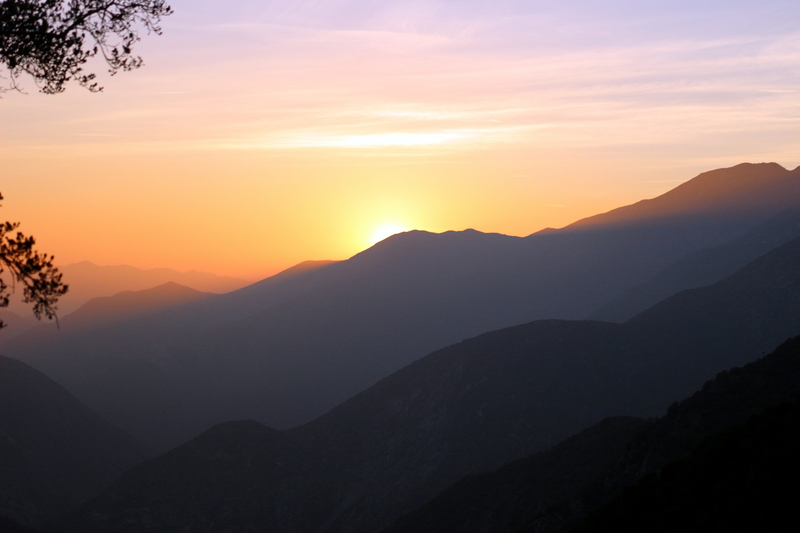 As we gained elevation, even the simplest of traverses began to seem risky, and we became unsure of ourselves. Finally, at the entrance, we were stalled by a final traverse that had a nice fall line straight down the cliff, almost directly over the lower mine entrance. Leaving the upper entrance is just as difficult as entering. We almost didn’t get past that point-we almost turned back. But it was a case where “The lust for travel was more powerful than the common sense” (quote from Across Eruope in a Paperboat). Once we turned the corner and entered the upper level, we skirted around a giant vertical shaft, and found some more tunnels. It was a lot dryer in the upper tunnels than the lower tunnels! Its a long way down. That branch in the foreground is about 3 in across, while the I beams in the middle are about 8-6 in across. 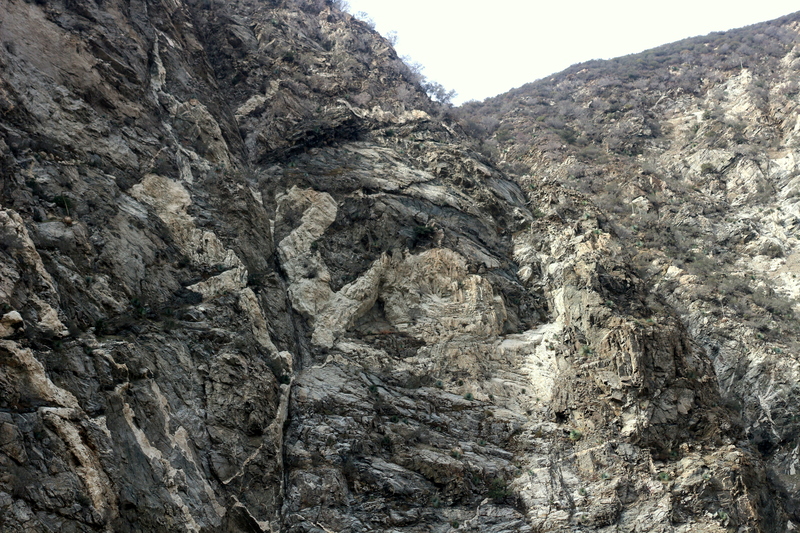 After exploring the upper portion, left the way we came, being careful not to fall and die. I would not recommend a trip to the upper mine due to the very long fall that is possible, and because it lacks any particularly amazing features, other than the pit. Actually, we were in Walnut Creek, but it is close enough to call it San Fransisco! As it turns out, the FBI and other defense organizations (Hello, DTRA) are pretty interested in DIYBIO. Coming away from the conference, it seems like the FBI is interested in exactly what you would expect: preventing bad guys (nefarious actors!) from doing Bad Things. The Defense Threat Reduction Agency on the other hand, is interested in buying technology from people who start in “garages”, or DIY environments, to use for defense work. 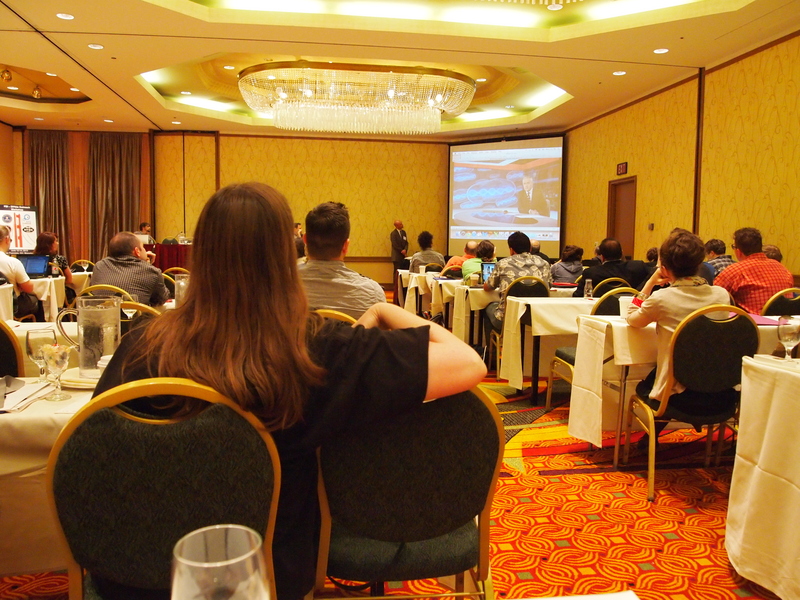 The main focus of the conference was on the interaction between law enforcement and DIY biologists. It seems to be that the FBI is not concerned with DIY biologists, and that the FBI certainly does not view the DIYBIO “movement” as a threat. 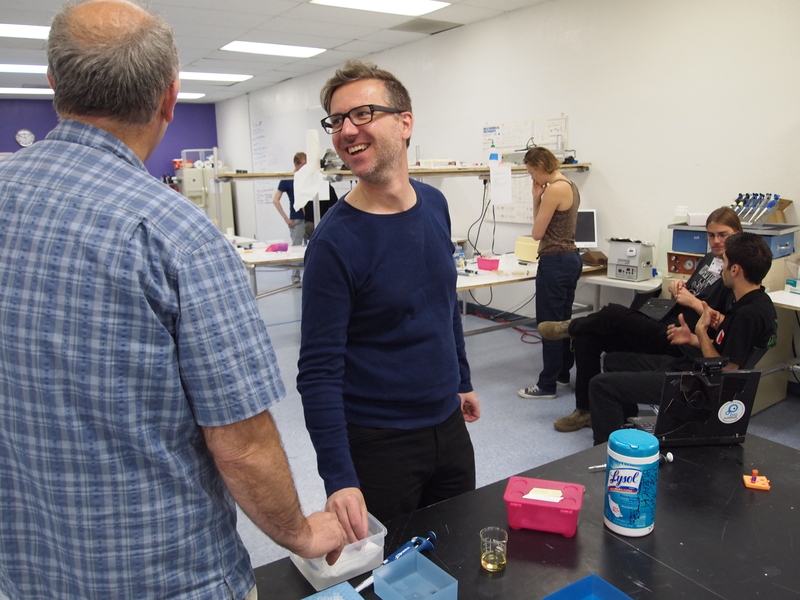 The position of the Bureau is that local DIYBIO folks should get a hold of their local WMD coordinator, It was also reassuring to know that the FBI hires PHD biologists and a lot of scientists to work in their WMD department- it would be nice if policy makers were just as well informed. The approach that we got. we are interested in debate, is't that lovely, PCR machines, exclamation points. This is what we read: we're going to do a piece on bioterror and flu virus research. And we knew that, we knew that we were going to be portrayed as extreme. We're the only group that can kind of say these things, we weren't the right people, but we were going to be their people anyway, and it was. This is what showed up in the BBC website.. "growing concern about DIYbio.. FBI, oh there you are". Biological threat, all in the same sentence. I thought it was very useful that we had Dan Grushkin, Rachel Turner, and Sascha Karburg -who have both done quite a bit of journalism- to tell us how the journalism works. It is important to have both sides of the story to really understand what is going on, so DIYers can engage the press more tactfully. Speaking of Sascha, we got to enjoy his documentary on DIYBIO at the end of the first day. After a few years in the making, it looked pretty awesome! I didn’t understand what they were saying most of the time, as it was in German, but the images definitely told a story. I think that the highlight of the conference was finally seeing who was out there, and what they were up to. If you want, you can read transcripts here, courtesey of Brian Bishop. The last day we all went down to Biocurious to play with some DNA. Biocurious walked everyone through the basic procedure for a chemical transformation, but the real highlight here was working with people from other places, and actually building a plasmid with the Genomikon kit. Overall it was fun to meet everyone, and exciting to see what the rest of the diybio folks are up to. I think finally meeting the European counterparts helped bring the community together. And it was certainly good to learn that the FBI won’t be knocking on our door any time soon. 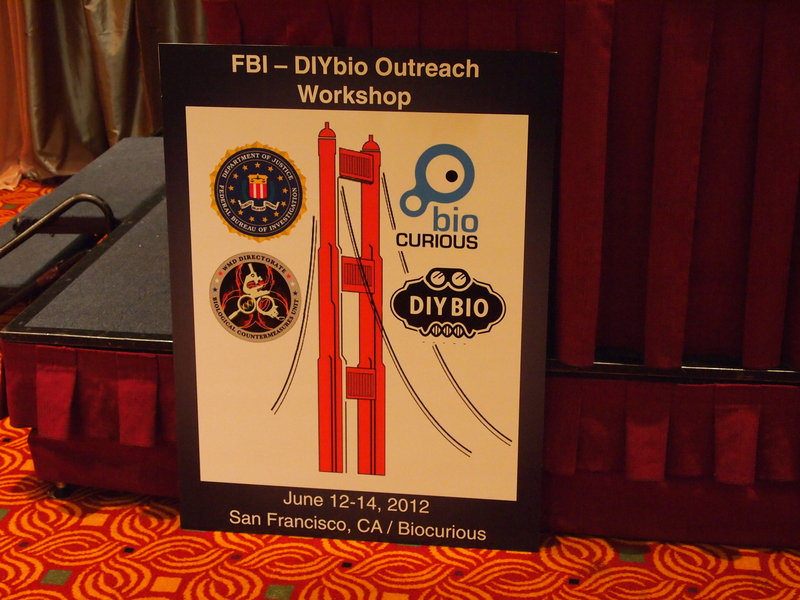 I have been invited to California to the FBI-DIYBIO outreach workshop. Day one is tomorrow. As I sit here slurping at the last of of my large java-chip frappacino (with whipped cream) at Bryant and Mariposa, I have to say that I am pretty psyched to see Biocurious, and meet all the other DIYBIO folks to compare notes. I will be posting my notes here on what happens!